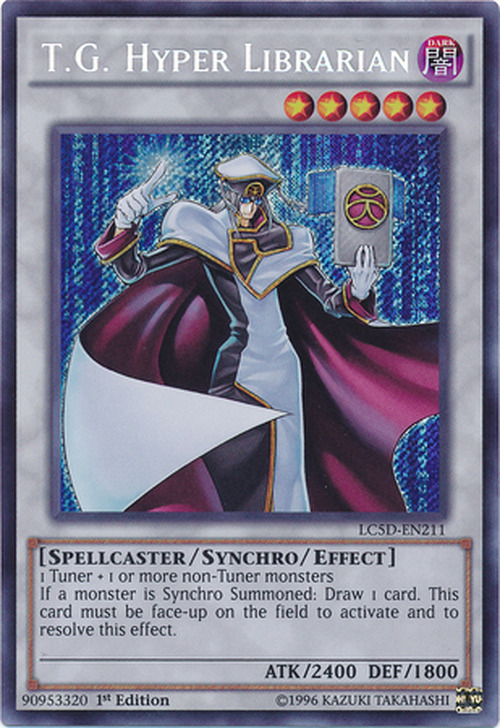 If a monster is Synchro Summoned: Draw 1 card. This card must be face-up on the field to activate and to resolve this effect. This card was the first member of the T.G. archetype to be officially released. This is the first T.G. monster that has only one effect. This is also the only one of the Level 5 T.G. Synchro Monsters that does not have an effect where you draw cards when it is destroyed. This card is also the strongest Level 5 T.G. Synchro Monster in terms of ATK. This card and T.G. Recipro Dragonfly are the only T.G. Synchro Monsters that do not have any Synchro Summoning requirements. This card is similar in effect to Royal Magical Library. Coincidentally, both of their names contain library or a variation of it. This card is featured on Synchro Library. This card's artwork is also used by Armored Kappa, though in a different position.